"All previous crimes of the Russian empire had been committed under the cover of discreet shadow. The deportation of a million Lithuanians, the murder of hundreds of thousands of Poles, the liquidation of the Crimean Tatars remain in our memory, but no photographic documentation exists; sooner or later they will be proclaimed as fabrications. Not so the 1968 invasion of Czechoslovakia, of which both stills and motion pictures are stored in archives throughout the world. Czech photographers and cameramen were acutely aware that they were the ones who could best do the only thing left to preserve the face of violence for the distant future. Seven days in a row Tereza roamed the streets photographing Russian soldiers and officers in compromising situations. The Russians did not know what to do. They had been carefully briefed about how to behave if someone fired or threw stones, but they had received no direction about what to do when someone aimed a lens." "Yes, the pictures of the invasion were something else again. She [Tereza] had not done them for Tomas. She had done them out of passion. But not passion for photography. She had done them out of passionate hatred. The situation would never recur. And these photographs, which she had made out of passion, were the ones nobody wanted because they were out of date. Only cactuses had perennial appeal. And cactuses were of no interest to her." stabbed through the middle, August 1968. I am just about mid-way through my annual summer teaching gig in Ann Arbor. After class on Friday, one of my smart students asked whether I had read Milan Kundera's The Unbearable Lightness of Being, to which I replied roughly: 'yes, many years ago, but I don't remember much of it.' So I decided to re-read the book. I'm not yet through, but Tereza's tromping the streets documenting the Russian invasion and smuggling film out to the Western press surely brings to mind the exploits of Josef Koudelka who, like Kundera, is a Czech ex-patriot. There are indeed many things I failed to recall about the novel, including not just the way Kundera characterizes compassion, but how he makes photography a central theme - philosophically, politically and personally. It is not just that - as Kundera remarks in the first of the passages I've lifted above - images provide the grounds for historical memory, but that events, especially political events, are - as he notes in the second passage - nearly by definition unique, non-recurrent. So photography affords some weight or ballast, as it were, to what Kundera might see as the "lightness" of events, offsetting "the mitigating circumstance of their transitory nature." One thing that seems clear is that security forces no longer need to be instructed about what to do when someone aims a lens. It is funny to think of Soviet invaders as being naive! "It was a drunken carnival of hate. Czech towns were decorated with thousands of hand painted posters bearing iconic texts, epigrams, poems, and cartoons of Brezhnev and his soldiers, jeered at by one and all as a circus of illiterates. But no carnival can go on forever." That remark brought immediately to mind the image by Koudelka I've lifted for this post. The anniversary of the invasion is not far off. Interesting post, Jim--I'll have to have a look at Kundera's novel myself (when I can get a chance!). 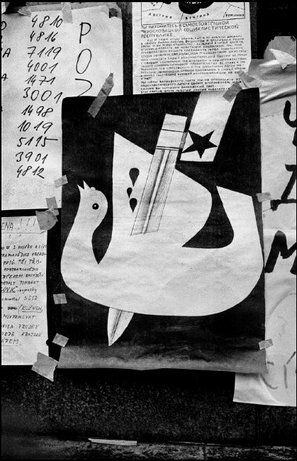 The dove poster in the Koudelka image seems to have an interesting icongraphic provenance: deeply reminiscent of John Heartfield's dove-on-a-bayonet originally made for AIZ in the 30s, after the police shooting of demonstrators outside a meeting of the League of Nations (and which was subsequently used--while Heartfield was a member of the party faithful in the GDR after the war--as an anti-Vietnam image). All that, then crossed stylistically with Picasso's Guernica.....keeps getting interestinger and interestinger, to coin a word!